Description “Prepare your Fat rich dishes like Sweets and other products with more healthier and tastier”. 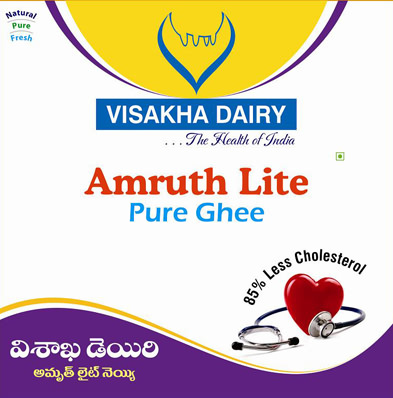 Visakha Dairy has launched “Amruth Lite Ghee” which was first in south India and the technology for manufacturing the product has been developed by “National Dairy Research Institute (NDRI)” and has been patented for the company for ten years. Application The product is highly recommended for people with cardio-vascular problems, for elder people and for people who are more health conscious. The product can be used in all dishes similar like ghee.